A caramel cream cheese mixture filled with ROLOS is swirled with a delicious chocolate sauce. This is one rich, delectable and outstanding dessert that is simple to make and is a crowd pleaser! Christmas is in 20 days. I am so excited!!! This year, I am hosting the Christmas Eve party at my house and have been brainstorming fun and delicious party food ideas for my company. My family loves dips, especially my husband. Thats where the idea to create this dip came from. 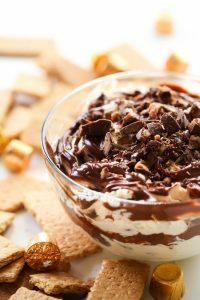 Today, I am partnering up with HERSHEY’S to bring you this yummy dessert dip and am so excited to share the recipe with you! The ingredients are super simple and this dip comes together in no time at all! This dip incorporates one on my favorite flavor combinations. Caramel and chocolate. ROLOS are such a great addition to this dip because it’s flavors compliment this dessert perfectly. It begins with a caramel cream cheese mixture that is absolutely wonderful! 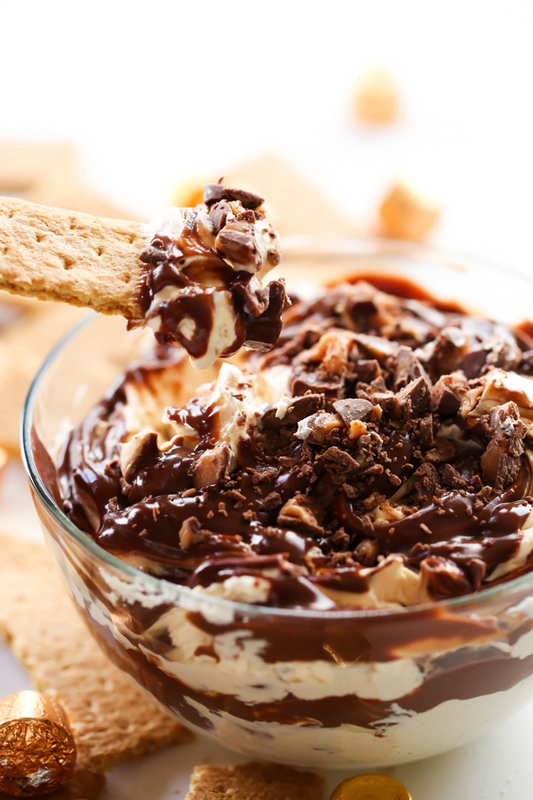 The second portion of the dip is an incredible chocolate sauce. 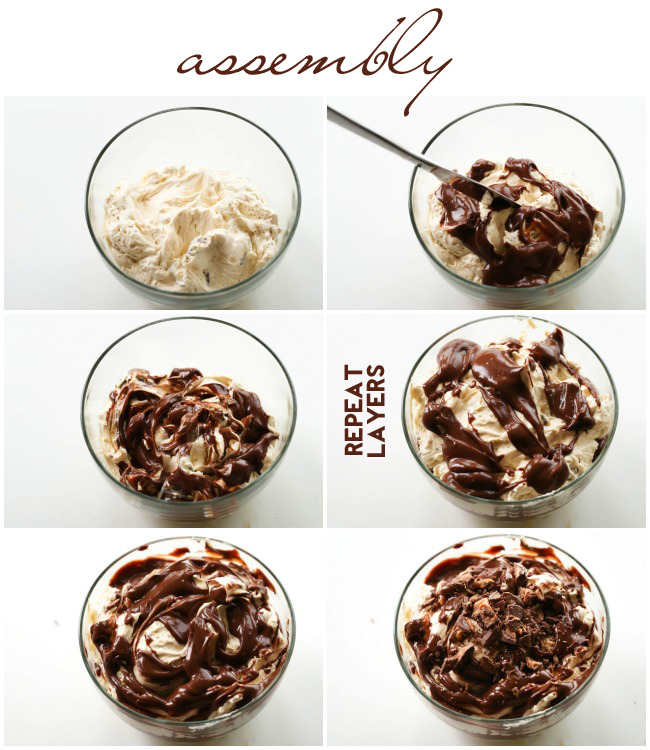 To assemble, layer half of the caramel mixture followed by half of the chocolate mixture. Using a knife, cut in and swirl the chocolate to incorporate it a little better into the caramel. 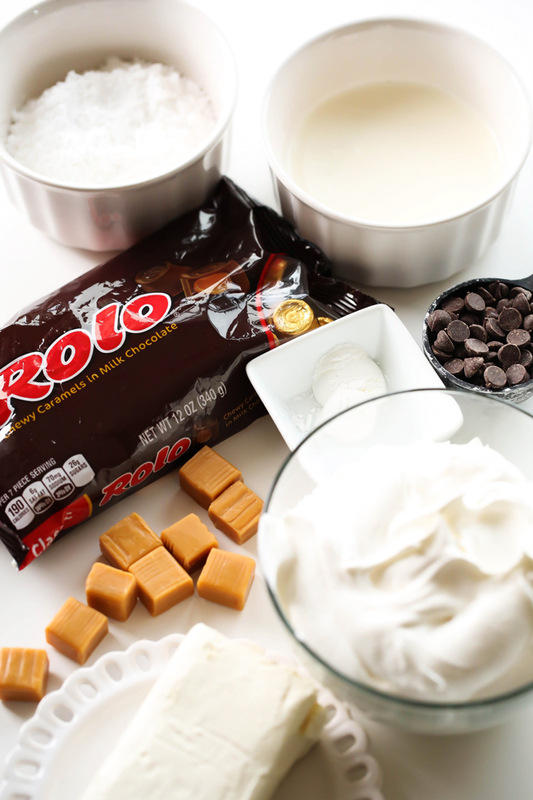 Then just repeat the layers and garnish with additional ROLOS. In a large mixing bowl, beat cream cheese and powdered sugar until well mixed. Set aside. In a small microwave safe bowl, combine unwrapped caramels and 2 Tablespoons heavy cream. Melt unwrapped caramels and heavy cream together in 30-second increments, stirring in between each increment until caramel is smooth and melted. Pour into cream cheese mixture and beat until well mixed. Beat in thawed frozen whipped topping until smooth and well mixed. Stir in chopped ROLOS, reserving a few for garnish. In a medium microwave safe bowl, combine ½ cup heavy cream and cornstarch and whisk until cornstarch has completely dissolved into heavy cream. Add HERSHEY’S Semi-Sweet Chocolate Chips, give a quick stir and heat in microwave for 40 seconds. Stir mixture and place back in microwave and heat for an additional 30 seconds. Stir and set aside. In a medium bowl, begin assembling dip. Place half of the caramel mixture inside bowl. Drizzle half of the chocolate mixture over the top and use a knife to cut the chocolate mixture into the caramel mixture. Layer remaining caramel mixture and drizzle with remaining chocolate mixture. 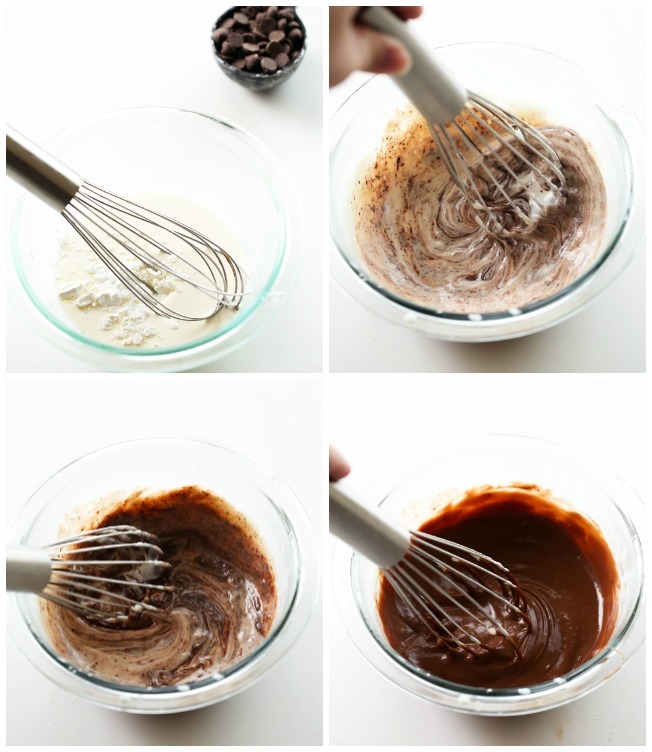 Use a knife to cut chocolate mixture into the caramel mixture. Serve with graham crackers or any type of sweeter cracker.